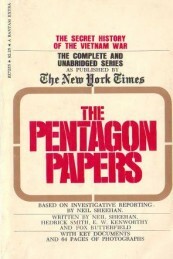 On June 13, 1971, The New York Timesbegan publication of a series of articles based on the Pentagon Papers, a one-million page top-secret Defense Department history of deepening U.S. involvement in the Vietnam War and analysis of what went wrong there. Immediately, the Justice Department asked for, and was granted, a court order blocking further publication of the series based on what they felt was an immediate threat to U.S. national security. In an already politically charged environment, the Pentagon Papers added fuel to the debate over America’s military involvement in Southeast Asia. But of equal lasting impact was the debate regardingprior restraint:can the government block publication of a controversial story before the public even sees it? No, according to the Supreme Court’s landmark 6-3 decision upholding the First Amendment right to press freedom. Publishers can be held responsible for the material after it is printed, but the government can not block its publication. With Neil Sheehan, Hedrick Smith was one of the principal reporters of the Pentagon Papers series and co-author of a subsequent book on the subject. by Neil Sheehan, June 13, 1971.
by Hedrick Smith, June 13, 1971.
by Hedrick Smith, June 15, 1971.
by Fred P. Graham, June 16, 1971. James C. Goodale, general council to the New York Timeswhen the Pentagon Papers were published, writes on the significance of the Supreme Court’s decision in the case. Synopsis of the Supreme Court decision.